The Children’s Museum of Indianapolis, already the largest children’s museum in the world, has expanded to offer visitors even more attractions. In March 2018, the 7.5-acre, $38.5 million Riley Children’s Health Sports Legends Experience opened, offering hands-on, indoor and outdoor sports-related fun for families. The new Sports Legends Experience offers a myriad of opportunities for kids and adults alike to get active. Basketball fans can practice footwork drills with WNBA star Tamika Catchings via a massive video screen, or check out the size of their hands and feet compared to two of Indiana’s most famous players. Of course, there’s no shortage of tributes to hometown heroes, from a display on the Indiana Pacers and the Indiana Fever to a state championship ring from Milan High School, inspiration for the movie Hoosiers. Kids can even try their free-throwing abilities against a shot clock or become the coach and select plays. Indiana is known for racing, and what child wouldn’t want to test their abilities on a pit crew? I think this was my favorite part of the indoor exhibits—kids get to grab (an appropriately sized) tire and put it on a race car while trying to beat the clock, accompanied by the unmistakable buzzing of the pneumatic wheel nut gun. The car of William ‘Willy’ T. Ribbs is also on display, and visitors can learn more about the first African-American to compete in the Indy 500 as well as races held in earlier years when motorsports were still segregated. Even kids who aren’t particularly interested in physical activity can find sports-related activities to keep them in the game. Future broadcasters can try their talents in radio and on television, and even send a recording of their air time home. The Children’s Museum is now the permanent home of the National Art Museum of Sport, providing inspiration to aspiring artists who can draw or sculpt figures in motion while sitting among works by LeRoy Neiman and local sports portrait artist C.W. Mundy. There’s no limit to what kids can do outside, and it’s a great place for them to burn off excess energy! Designed to encourage physical activity, attractions include a 60-foot Children’s Museum Guild’s Fantasy Tree House of Sports that children can climb to look out over the entire multi-acre complex. 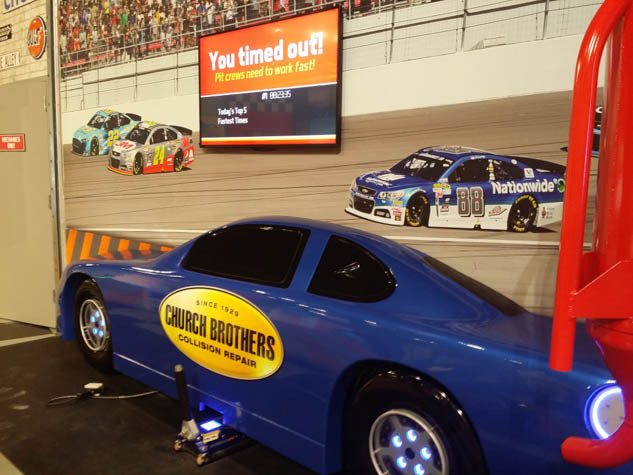 They can take part in the Indianapolis Motor Speedway Pedal Car Racetrack Experience, driving human-powered slotted pedal cars, or experience the thrill of timed racing during a pedal car drag race at the Church Brothers Collision Repair Drag Strip. Two lanes are for kids and two are for adults, so families can enjoy the entire experience together. Children who prefer a little less speed can get some exercise at the Jane and Steve Marmon Run-Walk Experience, or work out at different stations on kid-sized equipment on the Dr. Cory SerVaas Fitness Path. Future Wheaties’ box champs can also learn goal-kicking on the soccer field, serving and rallying in the tennis center and puck handling and shooting on an artificial ice hockey surface. Even golfers can get into the action on the Pete and Alice Dye Golf Experience presented by Henry and Christine Camferdam, which replicates some of their most famous courses and hole designs from around the world. What’s fantastic about the new Sports Legends Experience is that not only is every area designed for all ages so the little ones can have just as much fun as their bigger brothers and sisters, but each exhibit is also designed for every level of ability so that all kids can take part in the fun. The indoor exhibits are open year-round, and the outdoor exhibits are open from March through October. Families on a budget can appreciate that there are a number of Free Days throughout the year and low-cost First Thursday Nights, as well as Plan-Ahead Pricing that allows families to book tickets well in advance and save a lot of money in the process. To learn more, visit their site. Do you have a favorite children’s museum? Tell us about it on Facebook!